Eye: 53mm / Bridge 17mm / Temple 140mm. Tom Ford Box. Tom Ford Case. Tom Ford Cloth. Tom Ford Booklet. Tom Ford TF5495. Original box, case, cloth, booklets etc. Country of Manufacture: Italy. Lenses are not included and will need to be obtained for normal use. Mont Blanc MB 0390. Mont Blanc Case. Mont Blanc Cloth. Mont Blanc Booklet. Original box, case, cloth, booklets etc. Tom Ford TF 5473. Tom Ford Box. Tom Ford Case. Tom Ford Cloth. Tom Ford Booklet. Original box, case, cloth, booklets etc. Hand made to exacting standards, these eyeglasses also feature a patented spring hinge design for maximal comfort. The acetate is finished in a contrasting matte and gloss, accentuating an inset profile for the lenses. Mont Blanc MB 0674. Mont Blanc Case. Mont Blanc Cloth. Mont Blanc Booklet. Mont BlancBox. Original box, case, cloth, booklets etc. PRODUCT DETAILS. Mont Blanc MB 0349. Mont Blanc Case. Mont Blanc Cloth. Mont Blanc Booklet. Original box, case, cloth, booklets etc. OCCHIALI DA VISTA. OCCHIALI DA SOLE. COLORE / COLOUR: 204. NEW and ORIGINAL with FISCAL RECEIPT and GUARANTTE for 2 YEARS. CALIBRO / CALIBER: 50. E’ importante conservare lo scontrino per comprovarne la validità. Tom Ford Box. Tom Ford Case. Tom Ford Cloth. Tom Ford Booklet. Original box, case, cloth, booklets etc. Country of manufacture: Italy. Color: Flint with plano lenses - Ready for your RX lenses part # OX8035-0254 54mm. Grey Tortoise with piano lenses - Ready for your RX lenses part # OX8141-0356 56mm. Tom Ford TF5013. Tom Ford Box. Tom Ford Case. Tom Ford Cloth. Tom Ford Booklet. Dior Glasses Frames CD3279 8LE Grey Crystal Black 51mm Womens have a Grey Crystal Black plastic frame with a cat Eye shape, and are designed for women. These are the 51mm size with clear demo lenses. No detail of Zegna's designs are a result of chance or coincidence. Black with plano lenses - Ready for your RX lenses part # TF5147/O 001 52mm. MONTBLANC CASE. MONTBLANC SOFT POUCH. MONTBLANC BOOKLET. MONTBLANC BOX. Polished Blue Ice / Orange Icons with plano lenses - Ready for your RX lenses part # OX8089-0456 56mm. BE2073 3002. BURBERRY EYEGLASSES. 100% AUTHENTIC AND NEW. Mont Blanc MB 0490. Mont Blanc Case. Mont Blanc Cloth. Mont Blanc Booklet. Mont BlancBox. Original box, case, cloth, booklets etc. PRODUCT DETAILS. AR7070 5491 5417 140. GIORGIO ARMANI Fassung. GIORGIO ARMANI. - Giorgio Armani logo / lettering: brown. - Giorgio Armani Logo / Schriftzug - brown. GIORGIO ARMANI MADE IN ITALY K CE. BH = 3,4 cm. - Alle Angaben nach bestem Wissen und Gewissen. Size is 56-16-140. Glasses have been made in Italy. Starck Eyes case, cloth and booklet are included. Model: SF2787. Kate Spade. Gender: Male. Prada Sport. Yves Saint Laurent. OUR SERVICES WILL MAKE YOU HAPPY. OUR PRODUCTS AND PRICES WILL MAKE YOU HAPPY. High Quality Products at Competitive Prices. Model: VHE676K. 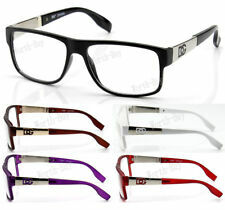 CH Carolina Herrera Eyeglasses. CH Carolina Herrera Case (Color & Style May Vary). Top of page. Item Includes. Prada PR 02UV. Prada eyeglasses. Prada case. Prada cloth. Burberry B2167 3001. fertigen wir Ihnen Ihre Brille auch gerne in Ihrer Stärke an! Brillenprinz24 - Sonnenbrillen zum Bestpreis. Diesen Preisvorteil geben wir an Sie weiter. Brillenbreite: 131 mm. B 2167 3001 5416 140. 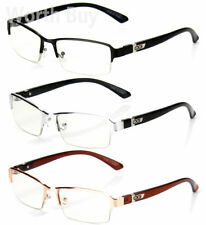 Modo Handmade Eyeglasses Frame Model 6512 Size 50-16-142 Free Shipping. Condition is New. Shipped with USPS First Class Package. TOM FORD TF 5478 B 001 Blue Control Made In Italy Size : 53 x 14 x 145 Lens Height : 38mm Frame Colour : Black THESE EXCLUSIVE EYEGLASSES COMES WITH ORIGINAL TOM FORD OUTER BOX, CASE, CLOTH & AUTHENTICITY CARD Shipping : Free : US & UK / From £9.99 Europe, Canada, Mexico, Brazil & Worldwide If you are unsatisfied with your purchase in any way. We offer a full refund on returns within 30 days. Prada PR 02UV. Prada eyeglasses. Prada case. Prada cloth. Original box, case, cloth, booklets etc. Prada PR 15TV. Prada eyeglasses. Prada case. Prada cloth. 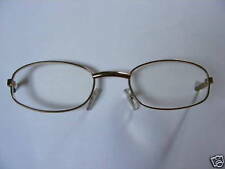 100% Authentic Burberry Eyeglasses. Burberry Eyeglasses. BURBERRY BE1324. Burberry Box. Burberry Case. Burberry Cloth. Burberry Booklet. Lens Color : Demo Lens. Excellent used condition. These list for $322 Lafont Style Operette #969. It has a hint of cat eye shape. Each lens is 50 mm wide. 14 mm bridge measurement. 142 mm temple measurement. Made in France. Triple layer plastic frames. Opaque black on front layer. Thin light green layer. Clear teal - turquoise - peacock blue on inner layer closest the face. The inner-facing color reflects upon the iris of your eye to bring out the blue and green colors in your eyes. Marvelous! 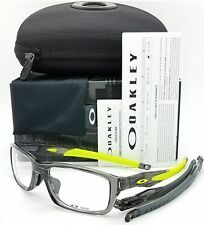 These come with removable prescription lenses. 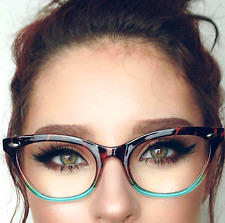 keywords: glasses eye glass optical French cat eye cateye. Francois Pinton T55 Eyeglasses Very Rare! Excellent condition!